Located on the beautiful, unspoilt and historic Hook peninsula, Hookless Holiday Homes is the premier choice for your self-catering holiday destination. We are located in the sunny south east corner of Ireland and are approximately a two hour drive from Dublin and about 45 minutes from Wexford town and Rosslare Harbour. We are situated on a private and peaceful five acre site which boasts fantastic sea views and an abundance of activities for all the family including a basketball and a tennis court, astro turf soccer ground and 2 children’s play areas. While the kids are busy playing, the adults can relax in the picnic area and make use of the barbeque facilities and seating areas overlooking the picturesque Sandeel Bay. Our houses are fully furnished to the highest standards boasting 3 ensuite bedrooms (2 with walk in wardrobes), a conservatory style kitchen/diner and a large spacious lounge and decking at both the front and the back of the houses. Wifi is available at no extra charge. Our luxury 3 bed cottages have a nautical feel which at just a stones throw from the beach you will feel right at home. With decking surrounding both the front and back of the houses you can enjoy both the morning and evening sun making alfresco dining a must for you and your family. Electricity is extra and is meter read. Pets are permitted, there is a pet fee of €35 per pet. These bright airy houses comfortably sleep 6. Each house consists of double and twin bedrooms depending on your needs. With en-suite bathrooms in every room and walk in wardrobes in the two upstairs you will have all the comfort and space you need. 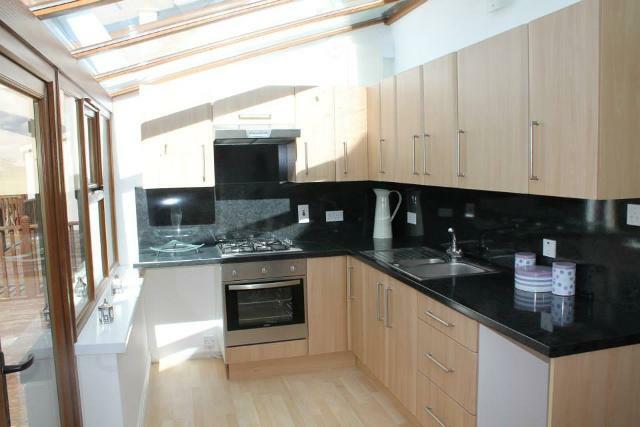 The conservatory style kitchen is fitted with all mod cons and has double doors opening onto a large decking area which is perfect for those relaxing sunny evenings. With over 14 beaches to choose from, your pick of fine dining, beautiful countryside views and an area steeped in history you are guaranteed a holiday to remember and you and your family will make memories that will last a life time and have you coming back year after year. Approximately a two hour drive from Dublin on the main N11 Wexford route and about 45 minutes from Wexford town and Rosslare Harbour, Hookless Holiday Homes are located in the Sunny South East corner of Ireland on the beautiful unspoilt Hook Peninsula. We are situated on a private and peaceful five acre site which boasts fantastic sea views onsite. With a basketball court, sports ground, and children’s play area, there is lots to keep all the kids busy while the adults relax in the picnic area and make use of the barbeque facilities. With beaches everywhere you look, an abundance of activities and hidden gems, you will not be idle. You’re guaranteed a holiday to remember and memories that will last a life time.